Head gear goes away during Phase Run? My Ranger's hood seems to vanish when Phase Run is active. In normal run, you can see the brown hood. 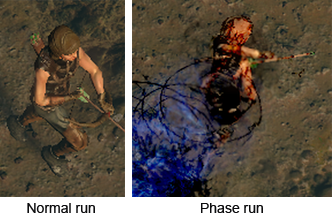 In phase run, her head looks like there's no hat, i.e. blond hair. EDIT: Also happens with other classes - I confirmed Templar, haven't double-checked others, but it seems likely. This is because of tech we haven't got yet - We'll hopefully get this fixed one day, meaning we can have better transparency effects. Ah, thanks. I noticed later that everyone's head turns the same color (light brown?) so it's not just the Ranger's hat disappearing.